a highlight for your elements collection! Encouraged by the great success of our acrylic element cubes we have decided to launch another minimalistic project - high-purity elements in their most puristic form. In the long development phase of these high-end collection pieces we have spared neither effort nor cost to combine precision with design and functionality. 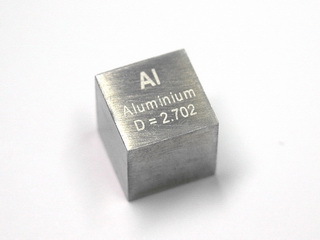 Each element cube was individually ground and polished by a tooling company to 10x10x10 mm to a precision of 0,01 mm, thus representing the theoretical density of the respective element by its weight. Labelling the cubes by laser does not alter their weight. Information, such as chemical symbol, name, or density is burned into the surface to last. Even at this stage each element will determine colour and appearance of the text by its specific physical properties. Altogether a set of 25 elements is planned. 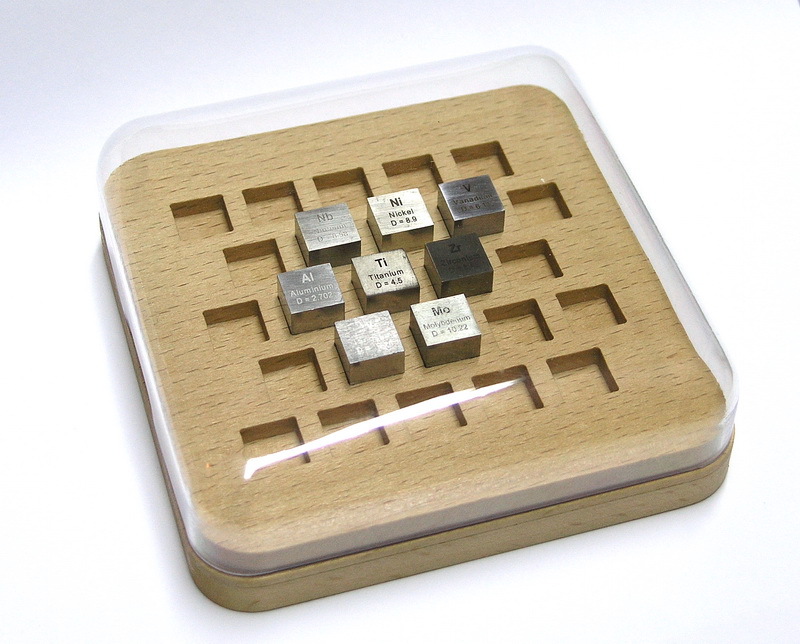 Most of the cubes have been cut from molten or sintered raw material to keep costs in line. Obviously, small deviations from the theoretical density will occur in the range of a few per cent, which is of no importance for display purposes, for instance in teaching. 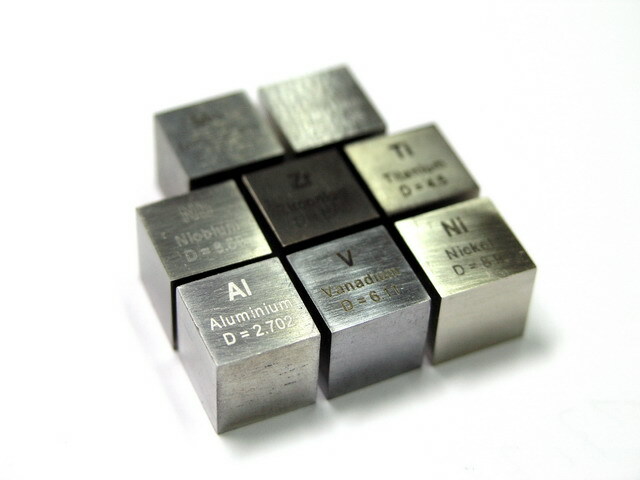 For laboratory use or for use as standards in scientific applications we also offer cubes made of monocrystalline material upon request. Quality has a price, and we therefore offer three sets, each more extensive than the preceding. 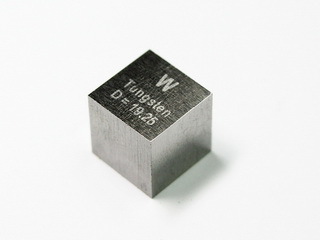 The basic set of eight cubes contains the following elements: aluminium, niobium, vanadium, titanium, nickel, molybdenum, tungsten, zirconium. The extended set will contain some of the more exotic elements and the luxury set will include all noble metals. For keeping and storing these sensitive precision pieces we have designed a suitable and representative cassette made of wood with a deep-drawn acrylic cover. Fusing nature and technology has been a challenge as each cube was supposed to fit snugly into its bed. Finding the correct kind of wood, which will not change perceptibly due to humidity or temperature, has taken months. We have finally made the bottom from three layers of staggered wooden plates glued together to give additional stability. For customers who prefer 100% technology we also offer a bottom made of high-quality white POM with a silken finish. Here the three layers forming the wooden bottom can be clearly seen. The closely fitting cover of deep-drawn acrylic glass protects the cubes against dust and gives the design a cool finishing touch. In total the cassette will hold 25 cubes.